Wash the potatoes, but you don’t have to peel them. Cut them into 1/4 inch slices. If the potatoes are very large, you can cut them lengthwise first. Drop them into a large pot of boiling salted water. Boil till they’re soft, but not soft enough to eat as is. Five – ten minutes should do it, depending on the potato. Drain them in a strainer, and let them cool till you can handle them. Warm the milk in a small saucepan, with all of the herbs and the paprika. Let them sit and steep while you’re waiting for the potatoes to be cool enough to handle. Butter a smallish baking dish with tallish sides. Put half the potatoes in, arranged in flat horizontal layers. Dot them with butter all around. Put the other half in, also in nice horizontal layers. Pour the herb-y milk over everything as evenly as you can. Dot with more butter. Bake for about 40 – 45 minutes. The top will get quite brown and crispy, and it should feel soft when you test the inside with a knife. Season with salt and pepper. This version doesn’t have herbacious milk. It has olive oil and lemon, though! 4 or 5 large (or the equivalent amount of smaller) potatoes. Boil the potatoes as described in the proceeding recipe. Mix the tarragon, chopped garlic and capers. Spread 1/3 of the potatoes. Sprinkle with goat cheese, drizzle with olive oil and lemon juice, and scatter with tarragon, capers and garlic. Put another layer of potatoes, and repeat all the fillings. Top with a layer of potatoes, and drizzle with olive oil and lemon. Bake at 400 until the potatoes on top are crispy and brown, and the potatoes inside are soft. Potatoes with caraway seeds, rosemary and smoked gouda. Scald the milk with a bay leaf, a teaspoon of rosemary and a teaspoon of caraway seeds. Let them sit and steep while you’re waiting for the potatoes to be cool enough to handle. Butter a smallish baking dish with tallish sides. Put half the potatoes in, arranged in flat horizontal layers. Dot them with butter all around, and scatter half the gouda. Put the other half in, also in nice horizontal layers. Pour the herb-y milk over everything as evenly as you can. Dot with more butter and scatter the rest of the gouda. 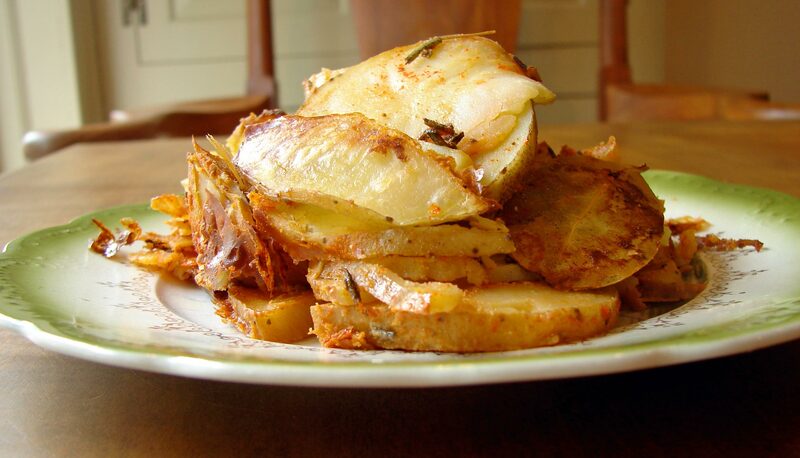 This entry was posted in potatoes, recipe and tagged caraway seeds, goat cheese, lemon, rosemary, sage, scalloped potatoes, sliced baked potatoes, smoked gouda, smoked paprika, tarragon by Claire. Bookmark the permalink. Claire: Great photo, makes me want to make roast potatoes for breakfast! Potatoes are my favorite vegetable also, I eat them possibly every day and my favorite style is something similar yours. I started cooking roast potatoes with every roast meat dish that I ever cooked many years ago, I remember them all the way back to my childhood, yet many Americans had never heard of them and thought they were fabulous; I was always getting request like “you must give me the recipe for those potatoes”; there ain’t no recipe, you just cook ’em with the roast! I’m amazed that there’s a Bob song I’ve never heard before, I thought I’d heard ’em all, thank you. We used to eat roast potatoes on thanksgiving – my mom would roast them with the turkey. Now I add a little olive oil, I suppose it’s to make up for the lack of meaty juices!! I was excited to hear a new Bob Marley song, too!! I wonder what else is out there?!? congratulations on 300 posts! Another potato fan here, I like them baked in their jackets best, really chewy on the outside (I prefer red skins) and fluffy in the middle, with butter and salt, yum. Your recipes look lovely and have reminded me to try potato cubes baked with rosemary again, had it as a teenager in France and have yet to replicate the wonderful richness of the version of the lady I was staying with made. It’s too hot to have the oven on today, but I will do it soon, thanks! Malcolm loves baked potatoes, and I really don’t make them enough!! We’re getting 90 degree days, here, so it’s starting to be too-hot-to cook season here as well. I’m not ready!! These sound really lovely. The tarragon and lemon in particular. I’m not keen on goat cheese though so will use something else, perhaps a sheep milk feta. The sage and rosemary sound great too. Love potatoes but I’m a total freak for butter so try and keep away from them as I just cannot resist it!